After Juventus Stadium this will be only the second such modern ground in Italy, but... Rome wasn't built in a day? It doesn't fit entirely, but anyway, before we see first works at AS Roma's new Roman stadium, you should definitely check Udinese's project progress. 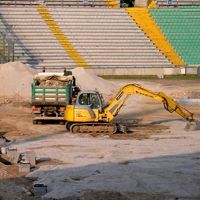 While Udinese Calcio players are preparing for their first season played at Stadio Nereo Rocco in nearby Trieste, their old ground is going through major changes. Having already renovated the main grandstand, now equipped with new seats, paintwork and cladding, the club went on to work on the pitch. On the first photos presented at StadiumDB.com (thanks to Francesco!) you may see how the existing playing field is being removed. It's going to be relocated closer to the main grandstand, making way for the new sections to be built on three remaining sides. First time ever the stadium will become football-specific, but not just yet. Currently seats are being removed from the old embankments, but the demolition of stands themselves won't begin until autumn. Once they're gone, construction of the new, single-tiered and fully covered new stands can finally commence. All changes should be done within 2014 and within the budget of €25 million. That scheme is very tight, so we will be looking at how effectively it's abided. Anyhow, Udinese should be able to start their 2015/16 season inside the new 29,884-seat-stadium at the latest..